There have been few books that have moved me as much as this extraordinary book by the Pulitzer prize winning journalist Katherine Boo. It is a stunning read, and one that every thinking Indian should read – well, not just Indians, everyone who has a heart and a conscience should read it, but to Indians it will have a special resonance. And it should be mandatory for everyone in Mumbai. 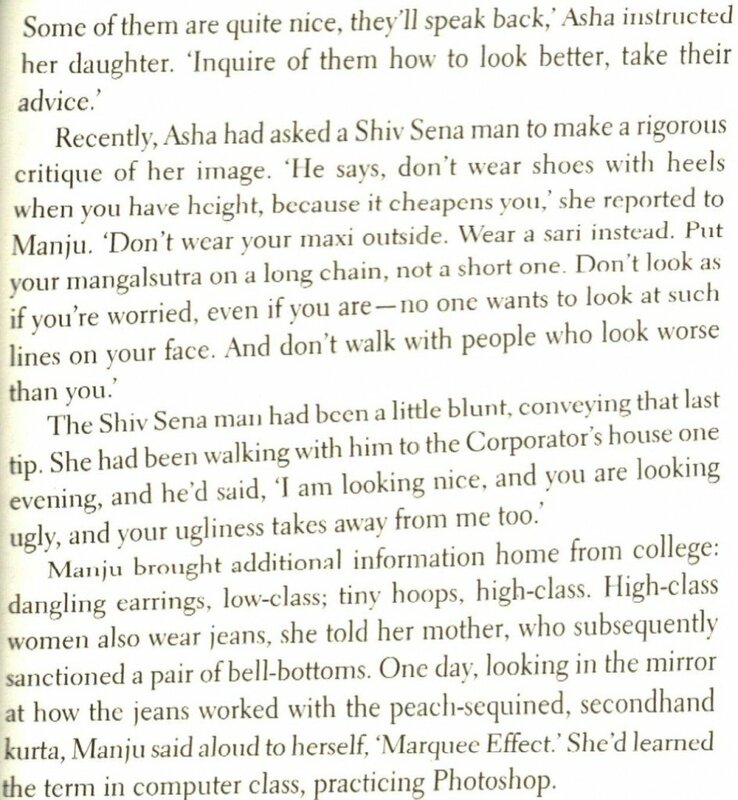 Ms Boo chronicles the lives of some of the dwellers of Annawadi, a Mumbai slum, close by the airport but a lifetime apart from the world of travel and hotels and leisure as it is possible to imagine. As a respected, award-winning journalist, Ms Boo invested years in this book, visiting the slum so frequently that the inhabitants soon ceased really noticing her as an outsider. They all had their tragically difficult lives to get on with, scraping together every paise they could find to try and keep body and soul together, so there was little time for sitting and staring at a foreigner. And so, for years, Ms Boo visited, talked, watched, observed, interviewed, recorded, filmed, checked, cross-checked – and then some. And the result is this amazing expose of life at the bottom of the pile. Literally, since we meet scavengers, children who collect rubbish for a living. We meet people who have a just-about home – rickety huts next to mounds of sewage. Life doesn’t get much worse than in Annawadi. Ms. Boo’s narrative is quite simply extraordinary, when you realise (and this is not a plot spoiler, by the way) that her book is not a work of fiction, but 100% pure fact. Everyone of those slum dwellers, corrupt officials, bribe-taking policemen, venal nursing staff – every man jack of them exists. And is named. This book pushes reporting about poverty and corruption in India to a whole new level. And throughout this compelling, albeit oftentimes heart-breaking chronicle, you never for a moment glimpse the presence of the writer, Ms Boo. She does not insert herself into the narrative for even a fleeting moment. She sits, listens, observes and lets the children and adults of Annawadi do the talking. The inhabitants of this appalling slum lead equally appalling lives of deprivation and degradation, tempered by a weary awareness that there may well be a better world out there. It’s just not for them. They see the airport and the airport hotels and the flashy cars, but always through the prism of what rubbish and garbage this brave new glittering world may leave behind for them, the bottom of the social pile. The rag-pickers and scavengers. I have to say that after reading this sensational book, I look at the filth and rubbish that lies all around my Delhi neighborhood with a slightly different view. I loathe the rubbish. But then again, I would, wouldn’t I ? It is a blight for me, not a business opportunity. 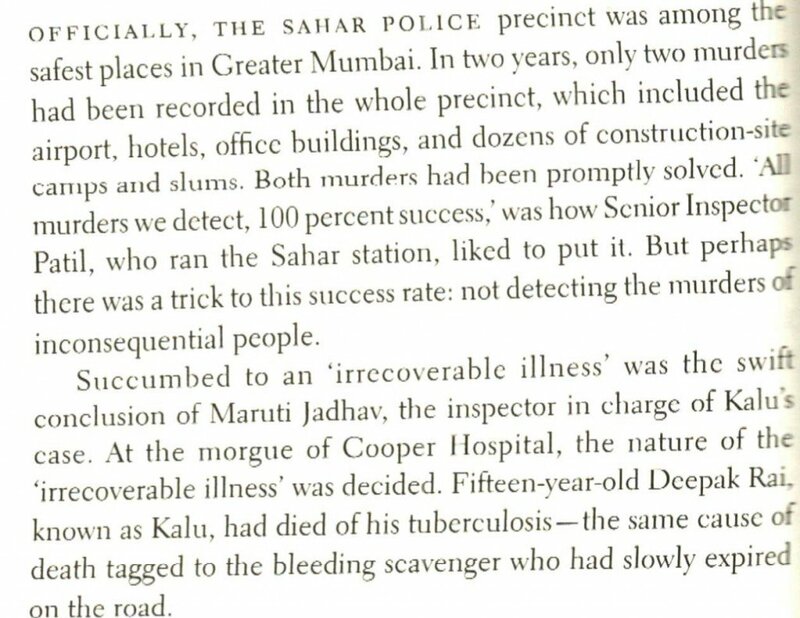 I found the criticism of the Cooper Hospital amazing, because 20 years ago, when I lived in what was then Bombay, I had to take the illiterate, non-Hindi-speaking wife of one of my Nepalese staff there for some unidentified stomach complaint, which our local GP couldn’t identify. When I went to admit her, I nearly died. A waiting room full to busting with hundreds of poor Indians, row after row after row, all waiting patiently. One tiny hole behind a thick grille into which you had to contort yourself to speak. Everyone told me “They are closed for lunch”. But, I hate to admit it, I played the foreign card. My woman was writing in agony, as were many other people in the waiting room, by the way. People were bleeding too. I marched right to the head of the queue, to the quiet, weary smiles of everyone else waiting – why are Indians so consistently polite to foreigners ? – and when the person behind the thickly grilled window said, in Hindi, “Closed,” I played my second card. That’s the one where I pretend I can’t speak any Hindi, and act appallingly stupid to boot, not understanding basic hand gestures and facial expressions. So I walked behind the counter, pushed open his cubicle door, and insisted my poor Nepalese lady got admitted. Eventually they did admit her, mainly to get rid of me, I suspect, because I just stood there talking louder and louder, until she was taken to the ward. I remember we had to provide all medicines and food, and I also remember throwing a scene at the state of the bed-sheets, making them strip the filthy many-times-used ones and put clean ones on for her. So clearly some things haven’t changed in 20 years. I’ve told this Cooper Hospital story many times over the years, but never has it resonated the way it did when reading this book. There isn’t an aspect of the world about them that doesn’t seem to exploit the poverty and lack of status of these slum-dwellers. The police, NGOs, hospitals, social workers, even Sister Paulette – they all abuse or ignore these people. I loved the vignette of the Congress party workers delivering manhole covers, just before the elections – and then promptly taking them back for use in another slum. Do yourself a favour and read this amazing book. It’s not always an easy read. Beautifully written, incisively observed, but the subject matter is searing and uncomfortable at times. “Behind the Beautiful Forevers” (the title is delicious, once you understand what it means) is published by Hamish Hamilton and the hardback costs Rs499. I’m going with 10/10 for an amazing read. Thoroughly, unconditionally recommended. If you would like to buy the book right now, nothing could be easier – simply click on one of the links below. An Oprah-validated book, “Dreaming in Hindi” is a fascinating account of a middle-aged American’s woman’s foray not only into India and learning Hindi, but into living in small-town India, and in a joint family to boot. From New York, where she has survived cancer and being fired from her job, the author travels to India on a free-lance assignment. Fascinated by the country, she decides to move to India for a year, to immerse herself in the Hindi that she had started to learn back in the USA. Thus Katherine Rusell Rich – a clever, intellectual but slightly world-weary New Yorker – ends up in Udaipur, a pretty (but small) town in the desert sate of Rajasthan. 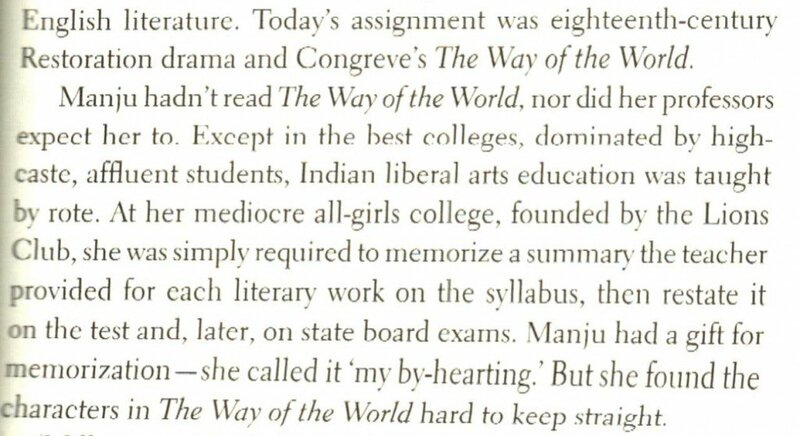 On one level, her adventures with language and life, with India and her eccentric fellow language students pretty much follow the path of any classic memoir of living in India. A good entertaining read, with huge dollops of indiscretion. This reviewer, for one, would love to know more about Helaena and her Maharaja. The writer is eager to learn and to adapt to India, and her portrayal of her new home is full of aching love and misgiving, of frustration and hilarity, and above all of deep affection for this new world she is exploring simultaneously on several levels. What distinguishes this book from any common-or-garden romp through India, is the academic analysis that accompanies her hilarious sorties and inevitable linguistic gaffes. The author consults neurobiologists, experts in linguistics, and researches the meaning and impact of second language learning, skilfully weaving it all into her narrative. As we follow her progress through India and into the complexities of the Hindi language, we also learn the whys and hows of thinking in another language. Make no mistake, this is not a light, fluffy read. Parts of it are hilarious. Some parts are slightly coy. Much of it is intellectual. It all adds up to a thought-provoking read. Dreaming in Hindi is published by Tranquebar and sells in India for Rs 395.